It is important that our homes receive the blessing of Holy Water. You can contact Father by telephone, e-mail or in person to arrange a date and time that are best for you and your family. You can expect Father to contact you if he hasn't seen you at Liturgy during the Nativity fast and Holy Days. 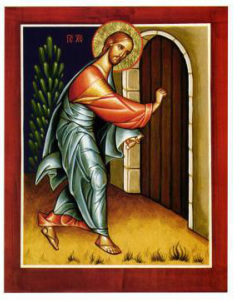 Christ, by entering the Jordan, sanctified it, and with it all creation. Material creation once again became "very good" as it was in the beginning The central sign of God's sanctification of all things through the feast of Theophany is the act of blessing the homes of faithful Christians. The priest visits all members of the Church to pray with them in the place where they live, and to bless their surroundings with Holy Water. He asks God to have mercy on the house, to rid it of every evil, and to fill it with every blessing. Thus the house itself, together with the living persons of the family, is "filled with all the fullness of God". • Make a list of the first names of those family members you wish to pray for when the priest arrives, with the living and the deceased in separate lists. • On your dining room table or family altar, place a lighted candle, a Theophany icon or icon of Christ, and a wide bowl (to hold the holy water the priest will bring). Be sure your prayer list is there, too! • Turn on a light in each room (in the evening), so the priest can see where he is going. • Turn off all Televisions, radios, cell phones, stereos, and computers. • Everyone in the house when the priest arrives should gather around the table/family altar and join in the singing of the litany responses and troparion. • The children may lead the priest around the house with a lit candle, if he permits. • How long does it take for Father to bless my home? I have a busy schedule! Father can bless your home quickly if you have a busy schedule. It is important for him to be able to visit and share with all the family members. A home blessing visit is one of the most valuable and important opportunities we receive during the year to have "one on one" time to discuss matters privately and in confidence with your pastor. • Do I have to prepare a meal? Welcoming your pastor to your home, praying and visiting with him is the most important thing! You are under no obligation to prepare or serve any elaborate meal for the priest. A warm cup of coffee on a cold January day, however, would be helpful! • What if I can't have Father visit my home at this time? Can he come at another time? The "stuff of life" can make a pastor's visit difficult at time. Your home may be under renovation. There may be an illness, travel, or other matter that complicates the daily flow of life. The most important thing to remember here is to COMMUNICATE with your Pastor! Your spiritual care and well-being are his most important concern. If the Ephipany season, at the end of January, is not a good time for you and your family for whatever reason, simply let Father know. He can keep in contact with you to determine when a good time is for everyone at a later date in the year. • How much should I pay the priest for this service? While it is customary to offer a small gift, on such occasions, there is absolutely NO OBLIGATION to pay for this service. (refer to Acts 8:18). The gift of your time, presence and prayer are more than sufficient!